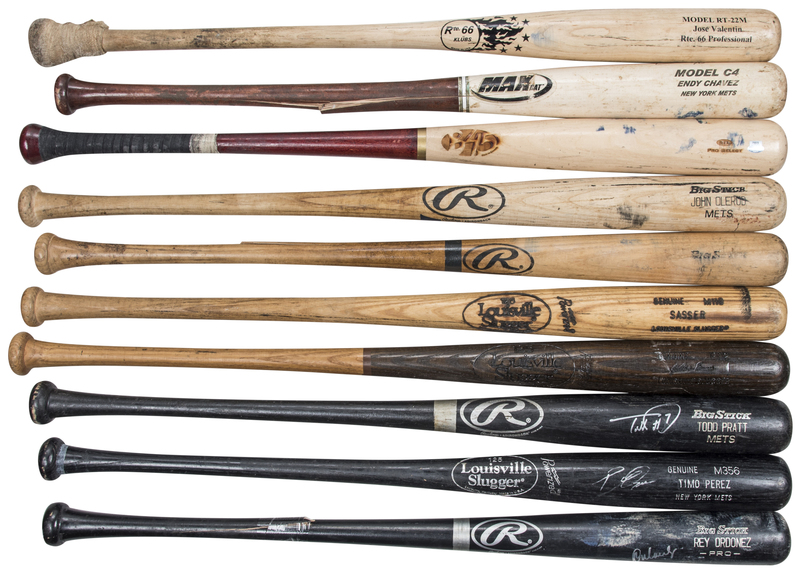 Offered in this lot are 10 game used bats from the 1990s and 2000s from former New York Mets players. 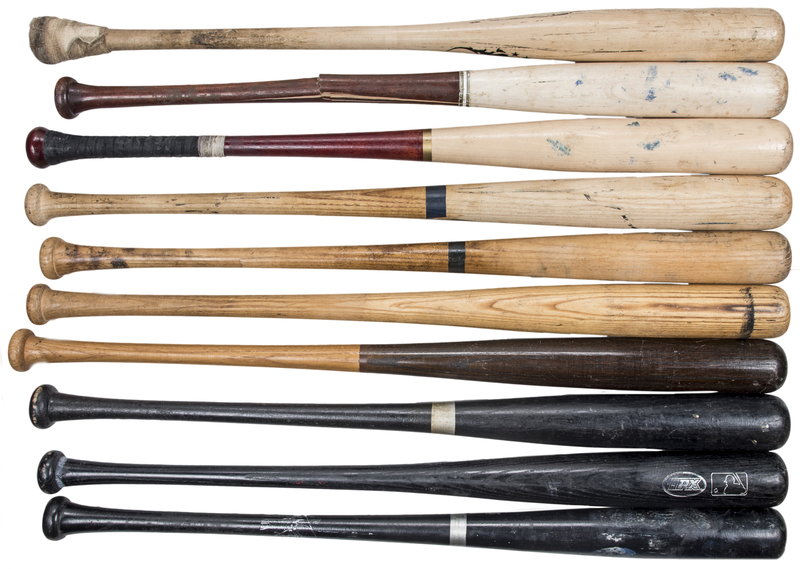 Five of those bats have been signed. The first bat is a Julio Franco un-cracked Louisville Slugger P72 model bat signed by Franco in silver marker on the barrel. This bat comes with a COA from Beckett Authentication Services (F63899) for the signature. The second bat is from Rey Ordonez and is a Rawlings M460S model bat that has been signed by Ordonez in silver marker. This bat comes with a COA from Beckett Authentication Services (F63898) for the signature. 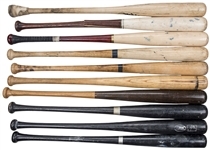 The third bat is Todd Pratt’s Rawlings 456B model bat that has a crack in the handle. Pratt signed his name in silver marker on the barrel and inscribed “#7”. This bat comes with a COA from Beckett Authentication Services (F63901) for the signature. The fourth bat is a Timo Perez Louisville Slugger M356 model bat signed by Perez in silver marker. The bat is un-cracked. This bat comes with a COA from Beckett Authentication Services (F63900) for the signature. The fifth bat is a game used Endy Chavez MaxBat Model C4 that has a crack in the handle. Chavez signed his name in black marker on the barrel. This bat comes with a COA from Beckett Authentication Services (F63902) for the signature. 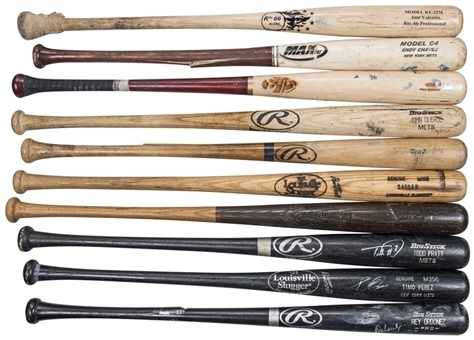 The next five bats are all game used but not signed. The first bat was used by Jose Valentin. Valentin’s bat is a Rte. 66 Klubs RT-22M model bat that is un-cracked. The next bat is Louisville Slugger M110 model bat used by Mackey Sasser. This bat has a slight crack in the handle. The next bat is a Rawlings 460B model bat used by Bret Boone. This bat has a crack in the handle. The next bat is a Rawlings 433B model bat used by Jon Olerud. This bat has a crack in the upper handle. The final bat is a B45 Pro Select model bat with the number “13” hand written on the knob end. The bat displays outstanding use. This entire lot has been pre-certified by PSA/DNA for the game use.